The Colibri Firebird Afterburner Cigar Lighter features three powerful jet flames, a clear fuel tank, and an oversized flame adjustment wheel that encompasses the entire bottom of the unit. This unique design makes for a super-convenient and reliable torch at an astonishing low price. Lighter quit working after a very short time, waste of money. I ordered this lighter along with some new cigars as I was re-establishing my humidor. I'm impressed with the 3-burner's ability to light even the largest cigar quickly. It's easy to refill, looks good and priced right. Works great and no tears if TSA discovers it. One for the porch, golf bag and car. Good flame. Works well in the wind. I could never go back to using a regular lighter. Worked well, great lighter for the price. Worked great at first but didn't last very long and finally just stopped. No spark at all. I had a 3 torch lighter that somehow disappeared a few weeks ago. I was looking for an inexpensive replacement and this looks much like the old one. I do wish this lighter had the same spring loaded lid as the last one. Had for about 3 years. No problems yet. Sees to outperform my other torches. A great little cigar lighter to but in your golf bag and the console of you car. great lighter - easy to see fuel level, works great! 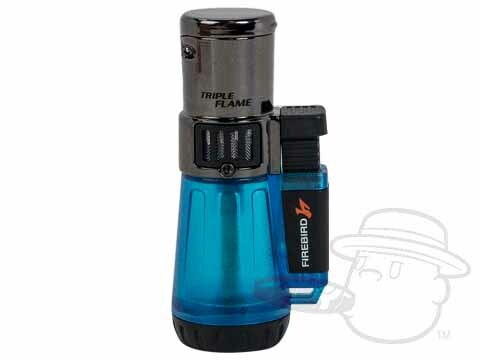 Colibri Firebird Afterburner Cigar Lighter - Assorted Colors is rated 4.3 out of 5 based on 24 customer ratings.